Gorgeous illustrations highlight US creatures under threat. We've all wondered at some point about what the most endangered species might be in each American state, right? But honestly, how could you ever hope to find all that information, let alone remember it? It's not as if anyone's going to make a helpful alphabetical list, and then supplement it with a full set of memorable illustrations, is it? Well just hold your horses there a moment, because someone's done exactly that. 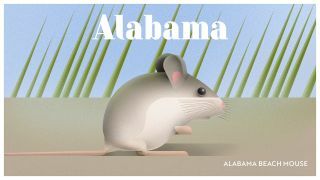 Finance company NetCredit commissioned its own illustrated tribute to the most endangered wildlife in every US state, and the results are both thought-provoking and, frankly, adorable. The project comes from UK agency NeoMam Studios, working alongside Duck Knees, an art director from Lithuania, and with illustrations from Serbian studio, Braća Burazeri. For each US state, the team identified its most endangered animal and found some pertinent facts, then celebrated the animals in questions with a set of eye-catching poster designs. The collection starts off in Alabama (most endangered animal: the Alabama beach mouse) and then works its way through the states alphabetically, taking in some amazing animals along the way such as California's Point Arena mountain beaver and South Carolina's Frosted flatwoods salamander, and concludes with the Wyoming toad, a rather forlorn-looking and warty specimen that's considered extinct in the wild. There are plenty of interesting facts for each species, but really it's Braća Burazeri's illustrations that are really going to grab your attention. Producing 50 animal portraits is quite an ask, but the studio's pulled the task off with aplomb and delivered them all with a very distinctive and stylised look that manages to capture the essence of each creature. To see the full set of posters and find about more about all these endangered species, head over to NetCredit's page.